Well, this is a bummer! We learned last month that Amex may restrict bonuses on the new SPG Luxury card if you’ve received a Chase bonus in the last 24 months. Basically, starting August 26th, it’s going to get a LOT harder to get Marriott points. They are cracking down cross-issuer (Chase/Amex) and even denying you the bonus if you have the SPG Business card – the first time we’ve seen denials for a personal card based on having a business product. The only thing not excluded is a Chase Marriott Business card, so if you have 2 5/24 slots, you could (seemingly) safely get the bonus on that and then this card. If you have the SPG personal Amex, you’d need to close the card and wait 30 days. If you have or had the SPG Business Amex or SPG Luxury Amex, you will have to be 24 months out from your last bonus award. If you got ANY SPG Amex in the last 90 days, you will not get the bonus. It does not reference the Ritz Carlton card, which today closed to new applications though people on Reddit have found a working link. Personally, I have 2 5/24 slots right now and had been waiting to see if this bonus would go higher than 100,000 for the launch of the SPG Luxury card (as competition). Now, I am just hoping that Amex releases the SPG Luxury card before August 26th so we can all make an informed decision on perhaps one last run at a card from each issuer to pad the Marriott point balance. It’s going to get REALLY hard to earn Marriott points going forward. This is a sad, sad day. Update: Gary at View from the Wing just posted even more detail including Amex restrictions (but still no launch date). 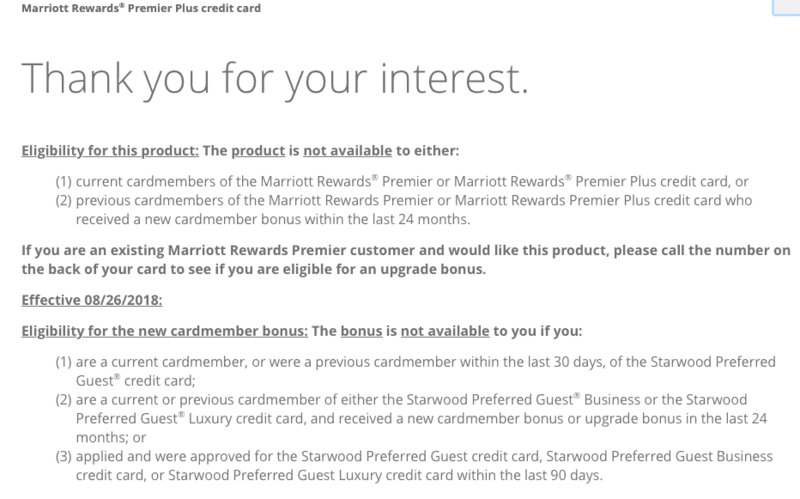 It looks like the SPG Luxury Amex will bar the following from a welcome bonus: Anyone that has acquired a Chase Marriott card (personal OR business) in the last 90 days or a welcome bonus from any Chase Marriott card (personal or business) in the last 24 months. You also are banned from the Welcome Bonus if you hold or have held the Ritz Carlton credit card. The new baseline SPG Amex will only restrict you from having a personal Chase Marriott card or Ritz Carlton card in the last 30 days. The Business SPG Amex will not Welcome you if you got the Chase Business card in the last 30 days or if you have acquired in the last 90 days OR gotten a welcome offer in the past 24 months from any Chase personal card. So you can get the Business Chase Marriott card and then, wait 31 days and get the SPG Business Amex bonus (if you’ve never had it). H/T: MilesTalk Facebook group member Paul F.
What are you feeling right now? Let me know here, on Twitter, or in the private MilesTalk Facebook group.